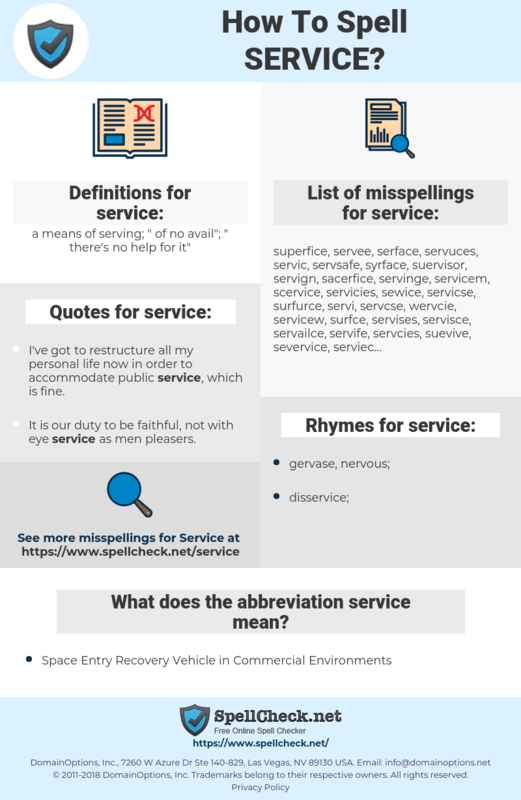 What are the common mistypes for service? What is the definition of service? What does the abbreviation service mean? What are the quotes for service? What are the rhymes for service? What are the translations for service? 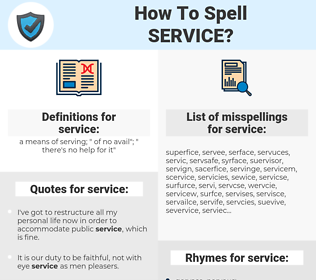 What are the common typos for service? This graph shows how "service" have occurred between 1800 and 2008 in a corpus of English books. I've got to restructure all my personal life now in order to accommodate public service, which is fine. Einsatz, Aufschlag, Aufgabe, warten, Leistung, Betrieb, Wartung, Bedienung, Service, decken, bedienen, Zustellung, Verbindung, Dienstleistung, Dienst, Gottesdienst, überholen, Messe, Angabe, Inspektion, Kundenservice, Serviceleistung, Bewirtung, Abfertigung, Dienstverhältnis, Streckenverbindung, Aufschlagball. servizio, funzione, prestazione, manutenzione, notificazione. サービス, 事業, 勤務, 奉仕, 取扱, 取扱い, 用途, 取り扱い, 用, 寄与, 務め, きんむ, ほうし, 儀式, きよ, 戦務, しっこう, びん, とりあつかい, 用役, ろうむ, せっきゃくたいど, しぎょう, えきむ, 取り扱, しゅぎょう, 接客態度, お愛想, ぎてん, おあいそ, お持て成し, 勤め, ことわざ, ほうこう, ほねおり. trabalho, atendimento, dar manutenção em, prestar serviço para, pagar juros de.